Is the educational experience of All Saints competitive with what public schools and other private schools in our area offer? 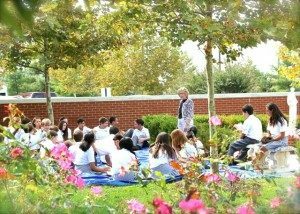 Accredited through the Virginia Catholic Education Association, All Saints offers an academic program that is rigorous and aimed at supporting the formation of the whole child ~ spiritual, intellectual, social and emotional. Graduates of All Saints advance to both public and Catholic high schools in the region and are often accepted into advanced academic programs. All Saints Catholic School received national distinction as a 2009 Blue Ribbon School of Excellence, the first in the City of Manassas. All Saints offers financial assistance through the Diocese of Arlington Tuition Grant Program (link). It is open to all qualified students whose parents might not otherwise be able to pay the full cost of tuition. Although pre-kindergarten students are not eligible for financial assistance through the diocesan program, funding may be available through our school and parish. Are your school and teachers accredited? All Saints Catholic School is an Arlington Diocesan school and follows the policies set by the Diocese and the Office of Catholic Schools. All Saints is fully accredited through the Virginia Catholic Education Association (VCEA) whose accreditation process has been approved by the Virginia Council for Private Education committee on Accreditation as authorized by the Virginia State Board of Education. All members of our faculty meet the VCEA or Commonwealth of Virginia certification requirements. Do you offer STEM (science, technology, engineering & math) opportunities throughout the school? Yes, STEM is introduced in kindergarten and is integrated throughout our curriculum. For details, please see All Saints STEM Programs. What special programs do you offer for middle school students? With a middle school population of approximately 150 students in grades 6-8, All Saints offers students ongoing opportunities to serve as leaders within our school community. Departmentalized so that each faculty member teaches within his or her area of expertise, our middle school prepares students for the transition to high school by fostering independence and responsibility. In addition to offering Spanish I for potential high school credit and Advanced Mathematics (which includes Algebra) for those who qualify, all seventh and eighth grade students take VEX Programming as part of their computer curriculum. Middle school students can also elect to participate in Robotics Club after school. Faculty integrate the use of Activboards, Google Chromebooks, and iPads to enhance classroom learning. All Saints also offers a wide range of extracurricular activities (link) that enrich the middle school experience from National Junior Honor Society to CYO Sports and the Peace & Justice Players. The nurturing environment and leadership opportunities are key elements of a middle school program that complements and builds upon the foundation established through the elementary years. How can I learn more about All Saints and the programs offered? Please register to attend an Open House or contact Mrs. Joyce D’Eugenio at 703-393-1490 or via e-mail at office@allsaintsva.org.